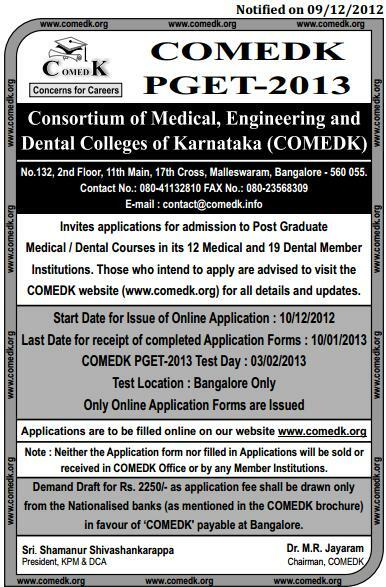 “Consortium of Medical, Engineering and Dental Colleges of Karnataka” (COMEDK). Institutions of the Consortium (Medical and Dental Colleges). themselves with the test procedures. it frequently for relevant information. Tribes (All India) and Other Backward Classes belonging to Karnataka State only. Medical Council of India / Dental Council of India Regulations. Member Institutions are NOT allowed to appear for COMEDK PGET-2013. Entrance Test organized by COMEDK (COMEDK PGET-2013) are listed below. great care about the category status. College Name Address Contact No. Courses Mentioned below are offered at the Member Institutions. candidates seeking admission to Post Graduate courses in Medical and Dental studies. The entrance test is being conducted for use by COMEDK Member Institutions only. admissions during the academic year 2013-2014.
test, counseling and other incidental expenses. DD. Check for the banker‟s seal and signature on the DD. taken to clear a particular subject/year.  Ensure that the online application form is filled up properly and completely. only once, to send the details to the server. need to be duly signed by the candidate. by the candidate and carried while writing the exam. of left thumb, left forefinger and left middle finger.  Kindly do not send any original documents along with the application form. tampered or hazy photograph will be rejected.  Please adhere to the time schedule enlisted in the calendar of events. confusion and may result in disqualification. (Rs.2250/-) if sent by the candidate will not be refunded. COMEDK contact no. (080-41132810) for clarifications. mentioned in the Calendar of Events will be rejected.  Printed Online Application Form. i. Candidate’s photo should be pasted (within the box provided). ii. Candidate’s signature (within the box provided). candidate (within the space provided). Final Year university examination marks card/s). attempt one has taken to clear a particular subject/year. Certificate / Course Completion Certificate. authority authorized to issue such a certificate. considered as General Merit Candidates. decision of the COMEDK Committee on this would be final and binding. name should not exceed 30 characters including the blank spaces. August 1992, fill as 24/08/1992. criteria for the course you select. Select your nationality as Indian. Select the type of Domicile Karnataka / Non-Karnataka. If Karnataka, Select type, i.e. By Birth / By Domicile. Government of Karnataka will be strictly followed. MCI/DCI and GOI established by law and located in Karnataka State. If you do not fall into the above two categories please select Non-Karnataka. Candidate/s) and OBC (Applicable to Karnataka origin candidate/s only). (Telugu / Tulu) or else select “No”. themselves as Linguistic Minority. (Applicable to Karnataka Candidates only). admission in the institution who has declared themselves as Religious Minority. (Applicable to all India Candidates). from other State also would be eligible. less than 50% just as General candidates. Parents / Applicant Annual Income should be specified. blank spaces to separate words. and Pin code in the address field. Enter the appropriate 6-digit PIN code. Bank and date of the DD. your full telephone number will be 08012345678. Enter your Mobile number if any. Enter your valid Email ID if any for speedy correspondence. Select the type of qualifying exam either MBBS / BDS. Select the month and year of passing of the Final Year MBBS/BDS. Select the University type studied (Indian/Foreign). select “Other” option and enter your university in the “If Others” field. should be on or before 30/04/2013). Select whether appeared for counseling / Seat selected /Seat Surrendered. the relevant columns, cross verify with the “Grand Total”. Note: 1. All the marks cards including that of failed, if any, need to be enclosed. have studied in Foreign University where the marking system may not be prevalent. send their queries through e-mail at contact@comedk.info for clarifications. website www.comedk.org for details and procedure. Please note that printed Brochures and Applications are not sold. processing is completed which is on receipt of the application at COMEDK office. indicating “Applicant Login” in the COMEDK website under PGET-2013 link. Ticket (Online TAT), and other alerts / information as specific to the candidate. PGET 2013 scheduled to be held on 03/02/2013. person to the candidates under any circumstances. in test centre would be considered. COMEDK website; www.comedk.org with effect from 15/01/2013. with covering letter and the Application No. on it. The covering letter regarding change request should be duly signed by the Candidate. Dental Courses. Each test will have 180 Multiple-Choice Questions (MCQ).  There will be no negative marking. other methods may be adapted to break ties vide 5.4.2.
based on the M.B.B.S. / B.D.S. syllabus as prescribed by MCI / DCI respectively. only. The test will be held on the mentioned time and date in all the test centers.  Test commences at 10:00 AM.  No candidates shall be allowed to exit the examination hall before 01:00 PM. erasers or whiteners is not permitted. and the Question Booklet only on completion of the test. neatly and accurately by the candidate with blue/black ball point pen only. in with pencil would be rejected for evaluation. videography so that their identity could be clearly established.  Attempting to take the test for someone else (Impersonation). shortly in the COMEDK Website).  Creating disturbance at the test venue.  Giving or receiving unauthorized help.  Leaving the test centre before the stipulated time. photograph will result in disqualification of the candidate. Request for use of toilet during the test is not entertained. authority, and also your test fee will be forfeited. The Final Merit / Rank List will be sent to all the regulatory authorities. in the evening, on 03/02/2013.  Test scores of COMEDK PGET-2013 will be published on 16/02/2013.  The Final Rank list will be published on 27/02/2013. COMEDK PGET 2013 process is completed. calendar of events will not be entertained. by COMEDK after the last date, as indicated above. entrance test and the same will be published on 27/02/2013.  The principle of least negative responses (Number of wrong answers). website at a later date. In this regard the COMEDK website www.comedk.org is updated regularly. COMEDK suggests all candidates to visit it frequently for relevant information. counseling for seat selection (iii) at the college level, during the admission process. process and this would be done at the discretion of COMEDK. parameters at any time during the selection process. representatives or any other office/s other than the office mentioned in this brochure. 10:30AM to 5:00PM, Monday to Friday, and from 10:30AM to 1:00PM on Saturdays. COMEDK Office is not operational on Sundays and other public holidays. can fax the same to +91-80-23568309. Institutions, the courses offered, and other relevant details. and responsible for the same.  COMEDK cannot be held responsible for loss of Rank cards, postal delays etc.  Applicants are advised not to send their original transcripts to COMEDK. COMEDK will not be responsible for any original transcripts sent. located in the jurisdiction of Bangalore city only. refer to our website for current and updated information. Q. What is the eligibility for the courses? A. As prescribed by MCI / DCI, candidates who have passed their M.B.B.S. or B.D.S. to complete their internship by 30/04/2013) are eligible for the courses. Candidate/s should also meet other requirements as prescribed by MCI / DCI. Q. Is the Entrance Test open only to Karnataka students? A. No, this test is open to all the eligible students in the country. of lower eligibility qualifying marks? Q. I have finished my M.B.B.S. a few years ago. Am I eligible for these courses? eligibility as prescribed by MCI / DCI. Q. Is there an age limit for admission to the courses? A. No, there is no age limit for admission to the courses. list provided in this brochure. Q. When is the last date to apply? date and time will be liable for rejection. Q. What is the procedure of seat selection? course on our website, www.comedk.org. Q. How will I know my test results? same will also be available on our website www.comedk.org. Q. If I have 5 clarifications in the answer key, then do I send a DD of Rs.500 or Rs.2500? Q. I want to seek clarification of my test score. Should I send a DD of Rs.250/-? Q. Would I get a refund for the amount, which I have sent along with my clarification/s? application form only after the completion of the COMEDK PGET 2013 process. Q. Can I send a black & white photograph with the Application Form? hazy photograph will not be accepted. Q. Where should the applications be sent and to whom should it be addressed? Appendix-I of the brochure is acceptable. Q. Whether COMEDK sends a hard copy of Test Admission Ticket to the candidates? Q. What are the enclosures to be sent along with the filled in application form? Note : Send the Application and enclosures in A4 size envelope only. behind the DD. Check for the banker‟s seal and signature on the DD. Demand Draft from any bank other than the Banks listed in the Appendix – I will not be accepted.  Photocopy of Internship Completion Certificate / Internship Completed Certificate. Religious / Linguistic Minority / SC / ST / OBC are liable to be considered as General Merit Candidates. Note: Avoid stapling of Demand Draft to the application form, instead use clips.